Spiritual Unfoldment Network classes with attunements from around the world for spiritual advancement and healing. Keith is a certified SUN teacher and is located in Santa Cruz California. The Spiritual Unfoldment Network offers classes in Esoteric Energy systems from around the World. Keith Darwin Rector is a certified teacher In the Spiritual Unfoldment Network and teaches distant attunement classes with the telephone, E-mail or Skype to you in your living room! Bring the spiritual unfoldment into your life now! Classes are ongoing and available one to one in your home for easy access to the world of subtle energies! SUN classes are all "Attunement" or "Shakti" based classes that help "OPEN THE DOORS TO DIVINITY ". Permanent changes in your energy bodies allow you to access cosmic energies at any time. SUN does not dictate your "Path", we provide tools for you to work with, to deepen meditation and help you advance spiritually! Series Classes from the Spiritual Unfoldment Network for healing and spiritual advancement. Look further down for Angel classes and many others for Meditation and healing. Miraculous Vessels is of Taoist origin. The name of this course comes from the energy channels referred to in the Taoist and pre-Taoist traditions by such names as the miraculous vessels, the extraordinary vessels, the psychic vessels or channels. One reason that has been given for the name of these channels is that they are remarkable reservoirs of energy; this energy can either be drawn upon or the vessels will hold what some traditional sources describe as virtually any amount of excess. What are the goals of this system? There are three primary goals of this initiatory system: (1) profound harmonization of body, mind, and spirit (2) compassion for all sentient beings (3) oneness and "reciprocity" with nature. Reciprocity refers to fully developing ones ability to draw on the energies of nature for personal and spiritual evolution as well as fully developing ones abilities to send beneficial energies to nature. This system contains a number of remarkable initiations for reciprocity which have become lost, even within the Taoist tradition. ($150 L1) Read More about Miraculous Vessels attunements. Huna is a spiritual tradition that places equal emphasis on connecting with your spirituality and connecting with the earth, your body, and your emotions. Rather than teaching transcendence of the physical plane, Huna teaches us to celebrate life, to merge matter and spirit. Connect more easily to the Earth and your spiritual self. In the S.U.N. workshops you will: Accelerate your transformation at every level of your being: physical, emotional, mental, and spiritual beyond what you have believed was possible. Receive powerful initiations ("shakti"). Direct energy purely by intention to create the desired experience. Release blocks which prevent you from manifesting your true nature. Directly experience the love of the God within you. These Angel classes offer attunements and shakti for helping you connect more deeply with your Guardian Angel to enhance your spiritual development. They have characteristics that are very powerful for personal guidance and direction in life. The best guide for your personal and spiritual advice is your own higher self, that is your soul and your Guardian Angel. With this inexpensive workshop you receive attunements that help with your communication to and from your Guardian Angel. There are attunements for meditation, Angel energy and dream communication. Keith recommends this class for everyone. It can have a lasting impact on you connecting with the Higher Self. Why pay a Psychic for advice, this costs less than one session and gives you great skills for a lifetime of guidance. The true source of our power (power "to" not power "over") and integrity is the Divine. Greater access to this source is blocked by the ego, which taps in only partially and tries to convince us it is the originator. The solution is not to "destroy" the ego but to make it more transparent, to see through it and to let in more light. In this workshop you will begin a 7-day Dissolution of the Persona Initiation and a 21-day Transformation of the Ego Initiation, which come from and will be overseen by the Angel. Permanently transform the ability of your heart to give and receive love with personalized energy work and ancient mystery school initiations from this extraordinary, beautiful and powerful Angel. This class has several attunements for meditation and subtle energies for spiritual transformation. Abundance refers to all forms of abundance, not only to financial abundance. The Angel of Abundance is one of a group of 22 powerful angels from the ancient western mystery schools. Receive attunements designed by the Angel to help you understand abundance on a deeper level, to become more abundant, to increase your ability to communicate with and receive energy from this Angel, and enable you to benefit more from an ongoing relationship with the Angel. This is the most significant course yet offered by S.U.N. on abundance. This initiation from the angelic kingdom results in a truly profound opening of the brow chakra. A common problem with getting the brow chakra open is that it closes down again as soon as we encounter the stresses of daily living. This initiation also places a shield around the brow chakra that protects you from negative influences in your environment. A remarkable property of the shield is that, rather than causing you to feel separate from your environment, it actually helps you feel more connected to life. There are seven classes of this Angelic Opening and Shielding of the Crown, base, spleen, power, heart, throat chakras. Taught separately so you can choose what centers you want to work on first or most important to you. Your pineal gland has many key metaphysical and spiritual functions ? including clairvoyance, linking you to your Higher Self, and accessing advanced states of consciousness. This initiation uses a beautiful golden energy to permanently heighten functioning of your pineal. This ancient Egyptian initiation empowers you to access a wondrous, beautiful energy, leading to the highest meditative absorption in God. It is more balanced than most Eastern energies used for this purpose and it grounds divine bliss throughout the body, leading to states of vibrant, sensual aliveness. This is a VERY blissful meditation and can take you very deep. The antahkarana is the link between your personality and your higher self; it is composed of matter from the higher mental planes. Anyone who has engaged in any spiritual practices has worked at building their antahkarana, whether they realized it or not. However, you can only go so far in your spiritual evolution without working at this consciously. This course contains attunements for strengthening the antahkarana and specific procedures hidden "between the lines" in the Bailey writings. To take this workshop, you need not have any previous experience working with crystals or gemstones, however it is essential that you be able to feel crystal energy. Through empowerments of your energy field, you will become able to magnify tenfold the energy field of a crystal or gemstone. You will have entirely new ways of: clearing and programming crystals, contacting your higher self, and making gemstone elixirs. Please bring a singly terminated quartz crystal and several favorite gemstones. Many students of Eastern traditions are surprised to find that recitation of the Lord's Prayer brings in an energy every bit as powerful as the energies brought in by the mantras of those traditions. Jesus was heir to the Kabbalistic tradition of Jewish mysticism and the energy brought in by the Lord's Prayer is a beautiful variation of a classic Kabbalistic energy. It is not necessary for anyone to take this course in order to bring in the energy, however receiving the initiation multiplies the power of the energy manyfold (just as receiving the initiation for an Eastern mantra makes it "jagrata" or "awakened" and increases its power manyfold). Jesus gave this same initiation to his twelve disciples. It brings in an energy which opens the heart and brings one closer to God. Essene Dove can bring many different gifts and can give you dramatic feelings of awakening to your true identity of being one with God. The Dove meditation practice creates a new subtle body "The Ark of Light" to receive profound energy initiations. This meditation strengthens your connection to your higher mind. This course empowers you to charge water with an energy that activates kundalini in a very powerful but completely safe way. The presence of the water balances the fire of the kundalini, preventing problems which often arise from kundalini. The water also enables the kundalini energy to be carried deeper into the structure of the cell than is typically the case. An activatable attunement (for yourself or others) that runs for 5 hours straight and does the most thorough job of clearing the meridians of anything we know. A two hour continuous transmission of a new energy. One exposure to this energy results in a permanent 30% reduction in the strength of one's negative patterns. The energy works by reducing the strength of the impulses going from the etheric brain to the nervous system when the pattern becomes active. This initiation from one of the three primary ancient Egyptian mystery schools enables you to send out from your heart chakra a "plum-like" nectar which spreads throughout the physical and subtle bodies, dispelling fear-based emotions and thoughts. In ancient times it was said that those who had this initiation, over time, became literally fearless. Neriya I - IV - $400 - $550 Prerequisite: Drisana III. This mythical Egyptian bird has become a symbol of long life and even immortality. Although the bird itself is mythical, its esoteric reference is to an energy which is quite real. No, we're not promising you immortality! However since ancient times there have been extraordinary stories of the rejuvenatory power of these energies. Clairvoyant observations and personal feedback convince us these stories are substantially true. If you take the workshop, you can decide for yourself! This is an ancient Egyptian initiation for developing spiritual clairvoyance. Compared to ordinary clairvoyance, fully developed spiritual clairvoyance allows you to see all the frequencies of subtle energy. Most work on releasing the influences of past lives focuses on the recall of dramatic events. In reality, what is most important is neither recall nor working with dramatic episodes but the energetic release of the samskara - a Sanskrit term meaning the limiting influences on our thoughts, feelings and actions built up through many past lives. This course gives you a comprehensive system for working with your samskara as they are ready to release. All energies are some combination of the twelve rays of creation. Usually the ray proportions are fixed In this system the ray proportions can shift significantly and so it is one of the most unusual and useful energy systems you will ever experience! This system can be used to permanently increase the strength of any other subtle energy or subtle energy product, even crystals. The most effective way to tap into the energies of the planets is to work with them in groups of three (the groupings being determined by their esoteric ray alignments). In this workshop you will receive unusually potent initiations for bringing in and grounding the energies of ten planetary triangles ? including those for manifestation, balancing male and female energy, realizing your soul purpose, releasing past life karma, and clairvoyance. You will also receive initiations for working with the angels associated with the planets. An extraordinary new energy system with activatable attunements for developing seven key qualities of heart: love, joy, compassion, courage, zest, faith and serenity. These beautiful, soul-satisfying rainbow energies can be used for yourself or up to a roomful of others. The system comes from Tara, the Tibetan benefactress. ENERGY BLESSINGS FROM THE STARS. This book from Irving Feurst the founder of SUN and Virginia Essene gives us all access to star energies from seven sources. They allow us to access the initiations from these stars ourselves at home. Get the book (Amazon or local book seller) and start in on the self attunements today! Irving Feurst my spiritual teacher has written this book for self attunement and to help all with their spiritual advancement. This book has tremendous information both about the future and the work we can do in the present for ourselves and our spiritual advancement. It is a simple procedure to receive self initiations for star energies that help us find more love in our life and those around us. This is a tremendous value to be able to receive seven (plus) initiations for such a low price and receive a dramatic amount of information. You will find this book to be a great value and has a wonderful impact on your life. The purpose of the book and the attunements is to develop Christ Consciousness , which is universal love for all. This is part of the divine plan of the Extraterrestrial Masters to help humanity, as we are a younger civilization. This is the first time a book has been used as a platform for initiations, rather than say teachers or gurus to bring them in. This is a movement to self-initiation with more direct connection to the higher energies. There is a class available for the second level of these energies taught by Keith Rector in Santa Cruz California. YOU MUST TAKE THIS SECOND LEVEL CLASS IN PERSON, NO DISTANT CLASS. Reiki is available in many cities with many different teachers. It is a simple energy that can be used for physical, emotional, mental healing and is used by many massage practitioners and nurses throughout the United States. The first level class contains an attunement for "running" the energy down the arms and out the hands to work with yourself or clients. This "laying on of hands" is not a religion, but rather an ancient method brought from Japan and has Tibetan origins. I can teach Reiki Distant but prefer to teach in person for the hand positions etc. Find a local teacher or I can teach you distant with the attunement and information. I have been a Reiki Master for over 20 years. Reiki is a great spiritual and healing energy system to start out with. Many of my students come to me with Reiki instruction and they understand the whole attunement process and the using of laying on of hands to help others. This is information about Reiki and the available attunement for level one and two. I am offering a simple class through the Internet for those who do not have access to a teacher or who can not afford the travel to the city. This is available through the E-mail at darwin@cruzio.com When you e-mail me, I will send you the basic information and then we set a date for attunements. You can not use the energy until you have the attunement! This is transmitted distant and You will be able to use it after that time. Instructions are in paper format and needs to be mailed, So include an address so there is no delay. Reiki is a Japanese Subtle energy system that was brought to America and is the most well known and accepted of the systems around. Nurses and massage therapists are the most frequent people who use it for deep relaxation and physical therapeutic purposes. The first level of Reiki gives you the ability to channel or run the energy on yourself and other people. It can be used for relaxation, helping physical and emotional problems and clearing out negative energy (after a bad day at work for example). The second level allows you to run energy distant to others. Level 1 is $100 and level 2 is $100. Take some of these great classes for your spiritual advancement. Contact darwin@cruzio.com We use Paypal with this email. 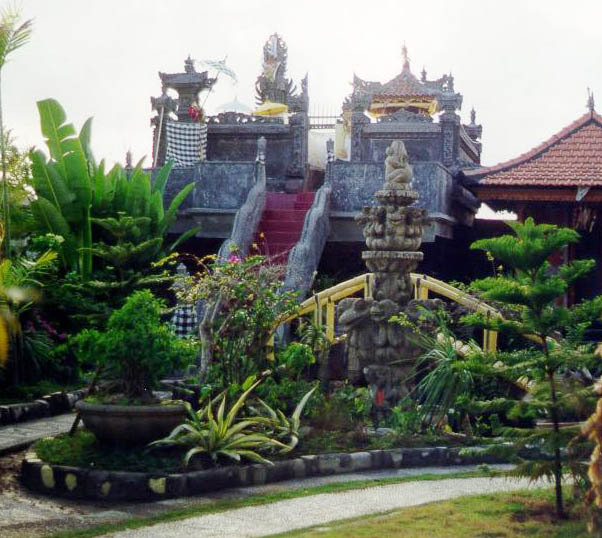 Garden with temple, coy pond and pool in Bali where I stayed. 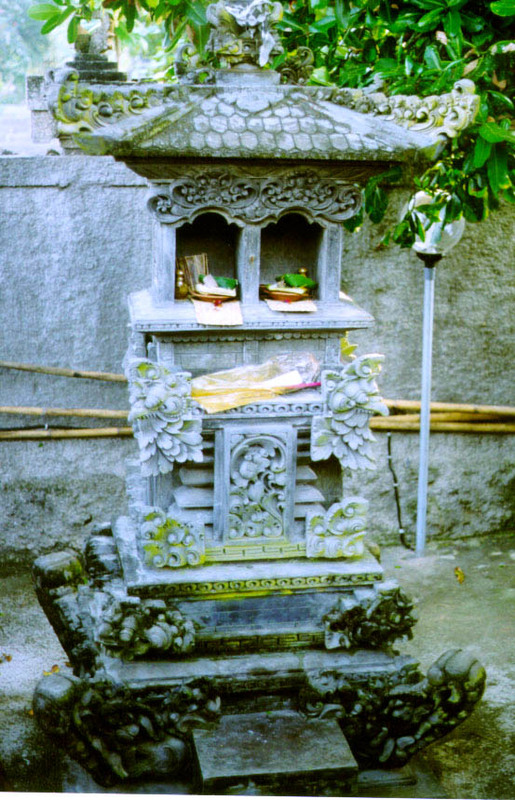 There are many temples of all sizes in Bali a Hindu island in Indonesia.